Wood and aluminum floor lamp. Lamp ddiseno Marset. Floor lamp with diffuser in pressed wood of 4 mm in natural oak or Wenge. Injected aluminium lacquered in Matt Black heatsink. Prepared for 36 LED bulb 9 SMD, 700mA 2700K 9 845lm and 36 SMD LED 4W, 4W 700mA. Extremely light, this light dish pays tribute to drummer Ginger Baker of the Cream, the 1960s rock band. The Ginger collection explores a new material and technology applied to the lighting industry: the conformation to high-pressure blades of wood and paper. The result is an air screen so only 4 mm of thickness, with white interior to reflect the light and exterior finish of warm wood. 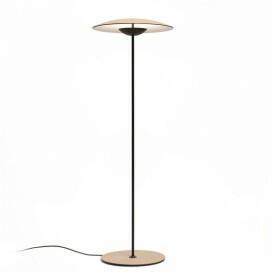 With LED technology, it includes two sizes of suspension, a version of foot and another table, to choose between the diffuser in oak or Wenge finishes.